A beautifully tender and absurdly humorous dreamscape, from the brilliant minds of Charlie Kaufman (Synecdoche, New York) and Duke Johnson, a specialist in stop-motion animation (“Community” episode, Abed’s Uncontrollable Christmas),the stop-motion animation wonder Anomalisa is a darkly comedic and surreal stop-motion journey of a man’s long night of the soul, Anomalisa confirms Charlie Kaufman’s place amongst the most important of American filmmakers, and announces Duke Johnson as a major creative force. 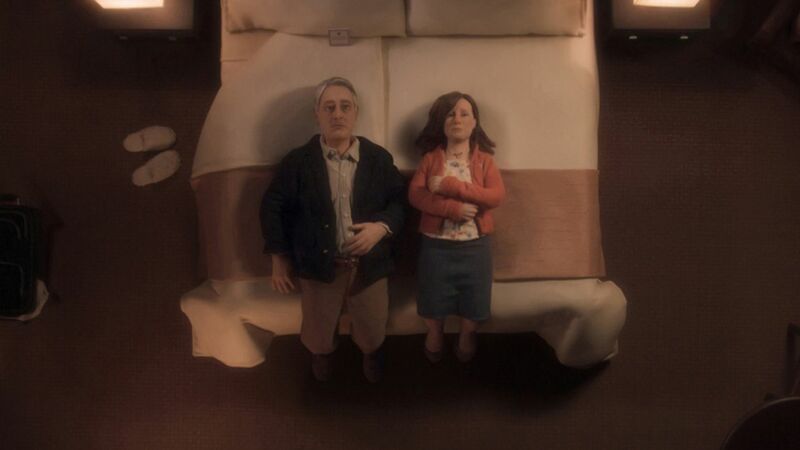 In Anomalisa, a depressed, husband, father and respected author of “How May I Help You Help Them?” is a man crippled by the mundanity of his life. On a business trip to Cincinnati, where he’s scheduled to speak at a convention of customer service professionals, he checks into the Fregoli Hotel. There, he is amazed to discover a possible escape from his desperation in the form of an unassuming Akron baked goods sales rep, Lisa, who may or may not be the love of his life. Initially funded through Kickstarter, Anomalisa premiered in Telluride before winning the grand jury prize at the Venice Film Festival. The first animated film directed by Charlie Kaufman and Duke Johnson began its life as a play in 2005, as part of composer Carter Burwell’s adventurous Theater of a New Ear project, bringing together Academy Award®-winning writer-directors Charlie Kaufman and Joel & Ethan Coen for a double-bill “sound play,” performed in New York, London and Los Angeles. For these performances, Burwell — who wrote the score for Kaufman penned screenplays’ Being John Malkovich and Adaptation and many of the Coen Brothers’ films — assembled a chamber ensemble, performing live accompaniment alongside Foley artist Marko Costanzo’s sound effects, as Kaufman’s “Hope Leaves the Theater,” starring Hope Davis, Peter Dinklage and Meryl Streep, and the Coens’ “Sawbones” unfurled on a barren stage with actors reading their lines from stools in the style of old-time radio plays. In Los Angeles, due to scheduling conflicts, the Coens’ play was replaced with “Anomlisa”, written by Francis Fregoli, the pseudonym of a well-known writer who was revealed to be Kaufman. On stage, “Anomalisa” told the story of motivational speaker Michael Stone — a British man living in Los Angeles with his wife and young son — who travels the U.S. giving rousing speeches to customer-service professionals. On a dismal stopover in Cincinnati, he meets Lisa Hesselman, a socially awkward sales rep from Akron who is one of his most devoted disciples. Starring Jennifer Jason Leigh, Tom Noonan and David Thewlis, “Anomalisa” was a feat of storytelling in terms of what it revealed and what it did not. In the audience of the Los Angeles production were husband-and-wife executive producers Keith and Jess Calder, who had assembled features including Faults, The Guest and You’re Next under their Snoot Entertainment banner. After the stage script fell into the hands of Dino Stamatopoulos, a co-founder of Starburns Industries, Inc., — alongside Dan Harmon, creator of NBC’s “Community” — “Anomalisa” began its transition to the screen, taking shape as Kaufman’s first animated film and Starburns’ own initial foray outside television. Launched in 2010, Starburns is a groundbreaking production studio specializing in stop-motion and traditional 2D animation. The company won an Emmy Award for Outstanding Achievement in Character Animation for “Abed’s Uncontrollable Christmas,” an episode of “Community” filmed entirely in stop-motion animation. 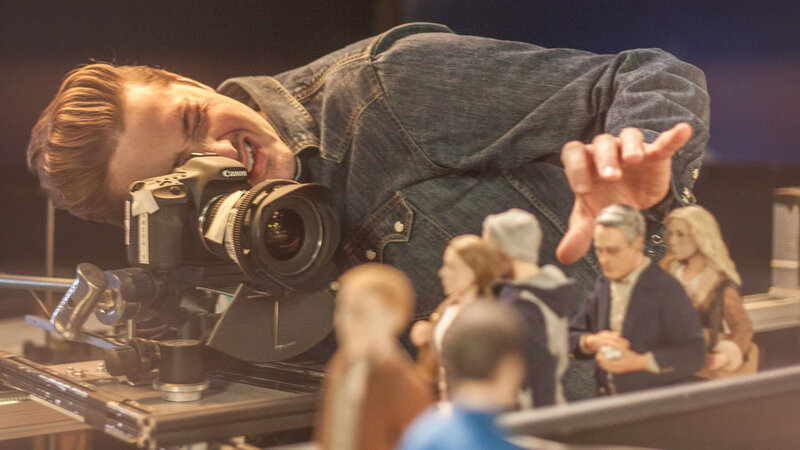 Duke Johnson, its director and producer, who also worked on Stamatopoulos’ Adult Swim programs “Moral Orel” and “Mary Shelley’s Frankenhole,” was chosen to bring Anomalisa to life as an animated feature for the big screen. “There was a lull in the studio after we had finished producing a special for one of Dino’s shows,” Johnson explains. “We were thinking of new projects and Dino had this Charlie Kaufman script — I’m a huge fan of Charlie’s work and jumped at the chance to be involved.” Producer Rosa Tran (“Robot Chicken,” “Frankenhole”) joined the creative team, working alongside Kaufman and Johnson as Anomalisa entered the animation phase. After a successful Kickstarter campaign, Kaufman and Johnson and Tran set about assembling a team of stop-motion specialists who could bring to animated life the trials and tribulations of Michael Stone and Lisa Hesselman and what happens to them at the Fregoli Hotel. The theatrical script for the most part remained the same. Kaufman and Johnson worked together to create Anomalisa’s distinct look and feel. With Tran they sought out the best talent in stop-motion, bringing together technicians specializing in sculpture, molding and casting, costume and hair design, scene painting, set dressing, and puppet animation, the intricate process of recording the movement of the foot-high puppets that became the film’s characters by staging them in poses and readjusting them for each photographic frame. 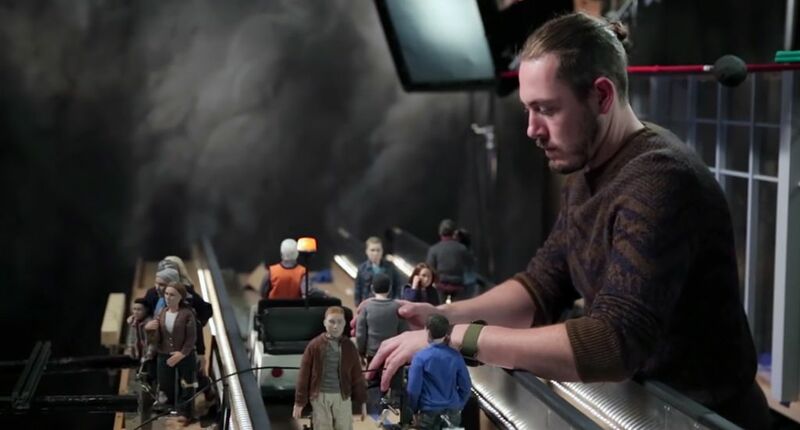 They hired cinematographer Joe Passarelli, who worked on Starburns’ “Mary Shelley’s Frankenhole,” for his experience outside the stop-motion realm — while ANOMALISA remains an animated project, its story unfurls in a world that feels decidedly real and mundane, from the innocuous clothing worn by the characters to the humdrum hotel suites, corridors, cocktail lounges and convention halls that contain them. The Anomalisa team strove at every level of production to make the world of the story appear real, with designers focusing on minute details like the characters’ glistening eyes, coarse features, thick hands, and otherwise lifelike demeanors. The filmmakers’ deliberately left the seams on the faces of Michael, Lisa and other characters to set the animation apart from typical stop-motion fare, in which two separate face plates on a character — the forehead and the lower face — are often painted out digitally to create a more polished, anthropomorphic look. Kaufman and Johnson preferred a warts-and-all approach, in keeping with Michael Stone’s existential predicament. Also intact, making a seamless transition from stage to screen, are the same core cast members from the sound play —Jennifer Jason Leigh, Tom Noonan and David Thewlis. Opting again to remain mum about his intentions with the film’s unique voice-over strategies — certainly Anomalisa is unlike any movie you’ve heard before — Kaufman says only that he was elated to work with his ensemble again, after performing the stage version exactly twice. Executive producer Keith Calder became involved with Anomalisa as early as 2012, after seeing the stage version and agreeing to provide a large portion of the film’s financing following a successful meeting with Kaufman and Johnson and the rest of the Starburns team. He was already a fan of both directors’ work. “I’ve loved Charlie’s writing since Being John Malkovich and I thought Duke’s animated “Community” special was incredibly well done — groundbreaking TV in that it was a fully stop-motion animated episode of a live-action sitcom,” he says. Calder’s Snoot Entertainment has produced features across a variety of genres and formats, including horror movies, documentaries and CG animation, but a stop-motion feature was new terrain — and a welcome addition to the company’s eclectic slate. On screen, Anomalisa fits in seamlessly alongside Kaufman’s signature works, including Being John Malkovich, Adaptation, Eternal Sunshine Of The Spotless Mind and Synecdoche, New York, modern classics featuring hapless but wholly unforgettable protagonists enduring the long night of the soul under surreal, darkly comedic circumstances. With its play-on-words title infusing the writer-director’s profound love of wordplay and language, Anomalisa addresses typically Kaufmanesque themes of isolation, loneliness, melancholy and depression, and the search for connection — or “a sort of hope for connection,” as Kaufman puts it.